Context: Molar-incisor hypomineralization (MIH) is described as hypomineralization of systemic origin affecting one or more first permanent molar and incisors. Aims: This study aims to evaluate the prevalence of MIH in primary schoolchildren from 7 to 9 years in Qassim region. Settings and Design: A cross sectional study included 411 school children aged 7-9 years chosen by stratified random sampling from public schools in 7 different cities of Qassim Region, Saudi Arabia. Subjects and Methods: This cross-sectional study was carried out to determine the MIH prevalence in randomly selected sample of 411 Saudi Arabian schoolchildren aged 7–9 years in Qassim region of Saudi Arabia. All the examinations were performed in the children's schools in good daylight by a single examiner, to eliminate interexaminer variability. The examiner was calibrated with the MIH diagnostic criteria of the European Academy of Pediatric Dentistry. Statistical Analysis Used: Descriptive statistics displayed in the form of frequency and percentage. Comparison between different study groups using Chi-square tests at significance level P < 0.05. Results: The overall prevalence of MIH in our study was 25.1% (n = 103). Of these, 256 teeth (5.2%) displayed only demarcated opacity and 42 teeth (0.9%) had posteruptive enamel breakdown. Conclusions: The prevalence of MIH in Al-Qassim region, Saudi Arabia in 7–9-year-old children is high (25.1%) with no significant difference between upper and lower jaws. Aim: The aim is to evaluate the inflammatory response of root canal irrigants such as sodium hypochlorite, mixture of sodium hypochlorite (NaOCl) with ethylenediaminetetraacetic acid (EDTA) versus a new root canal irrigant mixture of tetracycline isomer, an acid, and a detergent (MTAD). Materials and Methods: Eighteen Charles foster rats were injected with 0.1 ml of the irrigant solution; normal saline served as control. Biopsies of the skin were obtained at 2 h, 2 days, and 2 weeks. The chronic and acute inflammatory responses were studied in specimen. Results: Three percent NaOCl-induced maximum acute inflammatory response, followed by mixture of 3% NaOCl with 17% EDTA. MTAD did not evoke any significant acute inflammatory response. All the irrigants evoked almost equal chronic inflammatory reaction. During 2 h study 3% NaOCl, being the most inflammatory, mixture of 3% NaOCl with 17% EDTA being the least inflammatory. Chronic inflammatory reactions further aggravated in each treatment group at 2 days except in MTAD-treated rats skin which sloughed before 2 weeks with no sign of resolution of chronic inflammation. Conclusion: This study suggests that NaOCl evokes rapid acute inflammatory response compared to other irrigants under study, but subsided in 2 days. Its combination with EDTA also had similar inflammatory response as NaOCl alone, but of lower magnitude, suggesting NaOCl with EDTA as better root canal irrigant. MTAD caused necrosis of the skin tissue at 2 days and sloughing; thereafter, this study does not suggest its use as a root canal irrigant. Objective: The aim of this study is to evaluate and measure the residual dentin thickness from the furcation entrance to the canal orifice after canal preparation using endodontic rotary instruments in extracted mandibular first molars. Materials and Methods: A total of 15 extracted mandibular molars were included in the study. They are further divided into three groups as follows: Group A, B, and C (n = 5) and subjected to canal preparation using commonly available rotary instruments such as Gates Glidden, Hero Shaper, and Pro Taper, respectively. All the prepared mesiobuccal root canals were subjected to computed tomography imaging technique, to calculate the residual dentin thickness and the distance from the furcation entrance to the canal orifice. 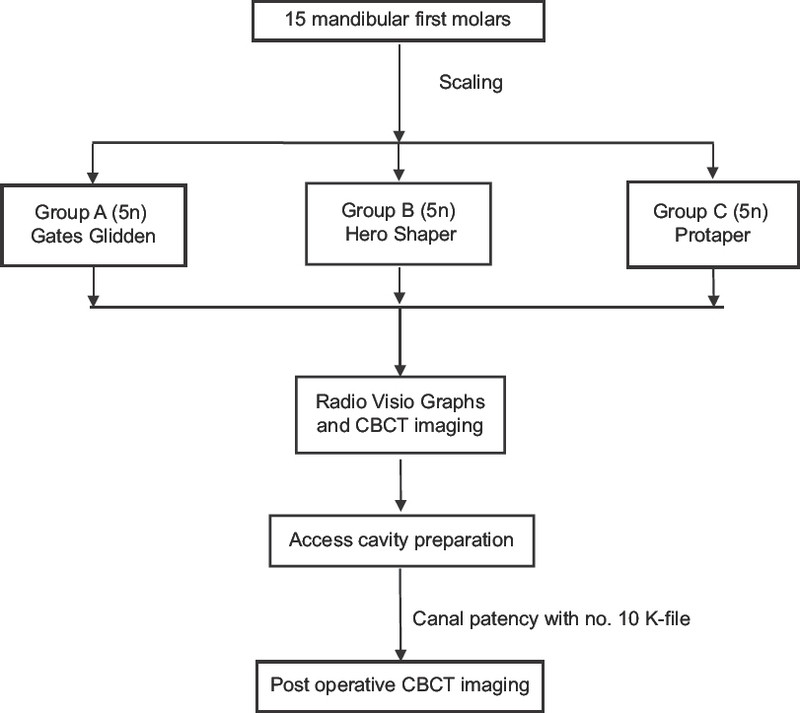 Results: The results showed that there was a statistical significant increase in the volume of the mesiobuccal canal of the mandibular first molars with all the three rotary instruments. The comparison made between preoperative, and postoperative measurements showed statistical significance between Group A versus Group C (P = 0.0039*), but no significant difference found between Group A versus B and Group B versus C. Conclusion: Within the limitation of the present study, it can be concluded that the amount of dentin removed from the danger zone in the mesiobuccal canal of the mandibular first molars was more with Protaper than gates Glidden. 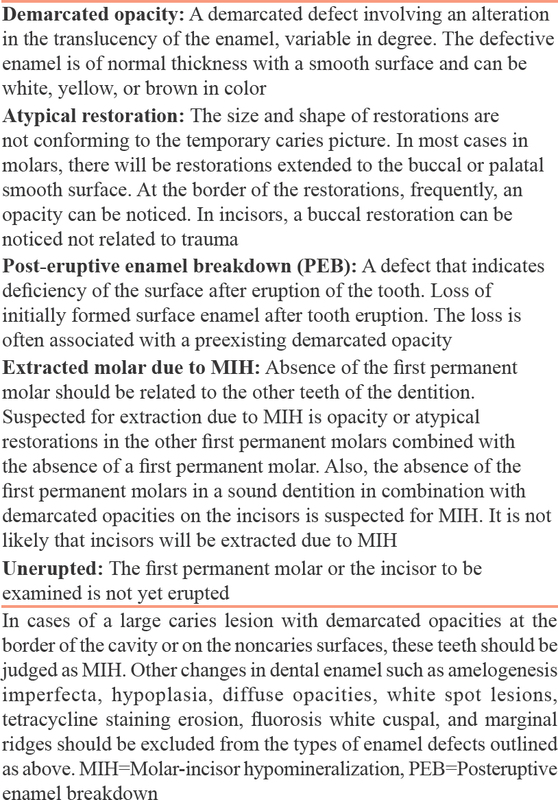 Hence, the use of newer endodontic rotary instruments in the danger zone may pose a risk for furcation involvement. Purpose: The position and size of the anterior teeth have direct influence on clinical appearance of the smile. The anterior teeth rarely follow all the mathematic rules of a proportionate smile. To determine maxillary anterior teeth proportions in Indian Population, their correlation with existing mathematical parameters and their reliability should be evaluated. Materials and Methods: A total of 350 participants were evaluated for healthy maxillary anterior teeth. Based on the inclusion/exclusion criteria, 230 were included in the study. Five photographs of the anterior maxillary area with three different angles were performed under standardized conditions. Images were analyzed and the data were collected. Results: The observed values of width and height were closely related to Proportion Gauge. 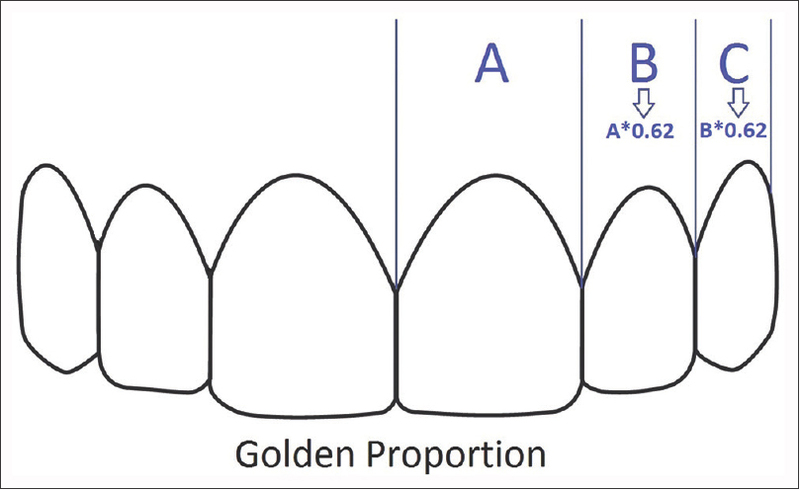 Width proportions between two adjacent teeth and the observed tooth proportions are in concordance with the values given by Digital Smile Design (DSD®). Variables defined were analyzed in Minitab software using descriptive statistics and inferential tests (t-test with 95% confidence interval). Conclusions: The Proportion Gauge and DSD® Protocol can be used for rehabilitation of maxillary anterior teeth in the studied population. Maxillary incisor teeth have been known to have single root with a single root canal widely. The reports of anatomical variations regarding the root number of maxillary anterior teeth are limited. This case report describes the nonsurgical endodontic retreatment of a rare case of two-rooted maxillary lateral incisor tooth, emphasizing the importance of three-dimensional imaging techniques for the diagnosis of anatomical variations. A 32-year-old patient was referred for the endodontic evaluation of his tooth #22 because of failed root canal treatment. Cone-beam computed tomography revealed a palatally located extra root. Nonsurgical endodontic retreatment was performed. At the 4th month follow-up, the tooth was asymptomatic and functional. 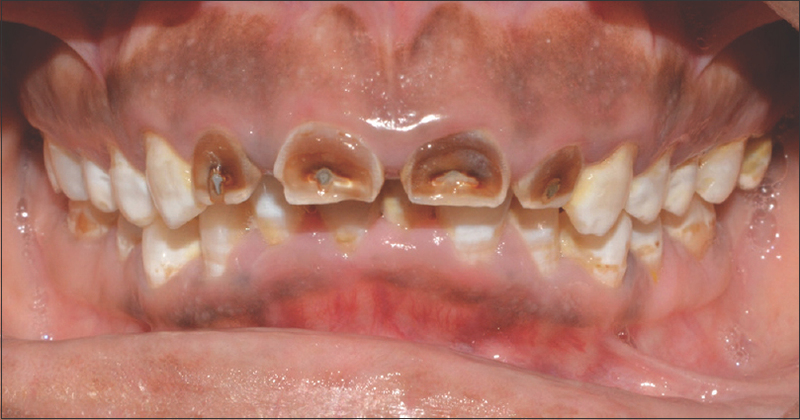 Most traumatic injuries to the upper permanent incisors result in crown fractures. It is commonly associated with luxation injuries. 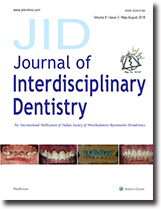 This report describes a multidisciplinary management of a traumatically intruded permanent central incisor tooth of an 18-year-old boy who presented late after trauma. The intruded tooth had been endodontically treated immediately after the injury while the tooth was in the same intruded position. Five years after the initial injury, the tooth was surgically repositioned and restored with postendodontic therapy with good esthetics. A multidisciplinary approach has often been utilized for esthetic rehabilitation of compromised dentitions. A thorough treatment plan is a prerequisite for achieving longevity in these conditions. This case report describes the management of a case of dental fluorosis with unesthetic gingival contours due to excessive vertical skeletal discrepancy in the maxilla, prognathism of maxillary anterior dentition accompanied with a short upper lip, by surgical intervention, followed by fixed orthodontics, endodontic treatment, gingival reshaping, and final restoration of the maxillary anterior dentition with porcelain restorations.